It’s common during the holidays that the seniors heat up the place on the ondol floor nearest the fireplace and waits for the grandchildren. However to the seniors who have no family to visit them and live lonely lives because of difficult conditions, the holiday adds their loneliness. When delivering rice and briquette to the seniors at the end of last year, the New Life Welfare Foundation members heard, “what makes them to miss most desperately is the people” from the seniors. They didn’t forget the seniors’ tearful word and came to have this event to let them feel the family love one more time before the holiday. 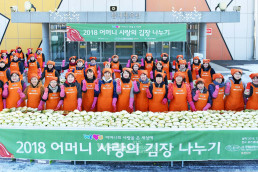 The event “Family love sharing with seniors living alone for the New Year” literally means that the members treat the seniors like their parents for a day. On the morning February 8, the New Life Welfare Foundation members and volunteer barbers from the sponsoring body “beautiful tie” brightly welcomed the seniors at the third floor assembly hall of the office of Geoyeo-2 dong, Songpa-gu, Seoul, Korea. While they cut the hair of 70 seniors at the same time, the sound of laughter and friendly talks from the seniors with the members filled the hall. When the members became companions to talk with the elderly woman Kim Seong-deok(83) who has lived alone for over 30 years, she said with tearful eyes, “I feel like crying for your kindness because I have lived alone for long.” The elderly woman Lee Byeong-ae(74) was moved by looking at the members cutting hair with devotion and said, “I believe it’s not easy to serve like this. You are such nice people.” From the youngest elderly woman Park In-suk(65) to the elderly woman Lee Byeong-hee(90) who had served for an independence movement all transformed into polished and gentle newly married brides and bride grooms. 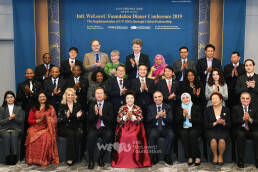 The chairwoman Zahng Gil-jah of the New Life Welfare Foundation visited the place and expressed the intention of the event, “We have prepared this event to share the warm family love with the lonely seniors.” She held each senior’s hand and consoled them. Then she became a companion with the elderly woman while helping them cut their hair and shared warm love with them by personally delivering foods to them for lunch. As the event was concluded around 3 pm, the chairwoman Mrs. Zahng wished for the health of the elders and presented rice and abundant holiday gifts to them. The members escorted the elders home with gifts. The elders went home with pleasant mind, pledging that they wouldn’t forget warm courtesy from the members. 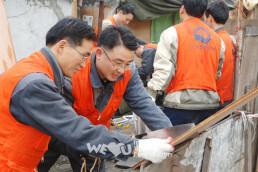 While the seniors were having great time, some members were ardently working to repair the houses. Form 9 am to 5 pm, the members replaced the floor paper, wall paper and repaired the houses including painting with their skillful hands. As the children visit their parents at long last and take care of the house chores wholeheartedly so did the members. The elders were pleased to find that their houses were being repaired gorgeously after they cut hair and came back home. Some elder even bought cookies and beverages to show his thanks to them. 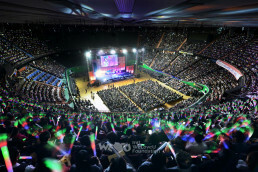 The members told that they were more pleased to be able to use their skills for the worthwhile thing. Moreover they added that they gained more through service by listening to the well-wishing remarks from the elders.